The global market is having an incredibly hard time today as the result of poor data that came out of China. As a result, several great stocks are trading an an incredible discount at the moment. One of those stocks is Gilead Sciences. Today, we’ll talk about the data out of China that’s leading to market wide declines, why GILD is a great stock to buy on the declines, and what we can expect to see moving forward. The data that caused the global market slide was the Chinese Purchase Managers’ Index, also known as PMI. In the month of December, this figure came in at 48.2. That proved to be a significant decline from November’s PMI of 48.6 and well below the contraction indication at 50. Perhaps more importantly, this is the 10th month in a row that the Chinese PMI has declined. China’s PMI is incredibly important to global markets because China is one of the world’s largest importers of raw materials. As a result, when purchase managers aren’t expecting to be buying as much, the global market declines. Throughout the year 2015, I followed Gilead Sciences incredibly closely. This is because, in my opinion, GILD has one of the most impressive stories in the biotechnology space today. The company created the world’s leading treatment for hepatitis C, known as Harvoni. Since then, GILD has seen incredible gains in revenue and earnings. In fact, in the past four earnings releases, Gilead Sciences beat earnings expectations. While GILD has blown away expectations with regard to earnings quarter after quarter for a year, the stock has not seen the exponential gains it deserves. One of the reasons for this is that earlier in the year, AbbVie released its own hepatitis C drug, and given the strength of AbbVie, this drug was expected to give Harvoni a run for it’s money. Nonetheless, that didn’t happen and Gilead Sciences has maintained its position as the leader in hepatitis C treatments. Due to the lack of growth in combination with today’s declines, GILD is trading at an incredible discount as far as I’m considered. While most stocks trade with PE ratios above 17, Gilead Sciences is trading at a PE ratio of below 10, and according to NASDAQ, it’s likely to offer a low PE for at least another 2 years. 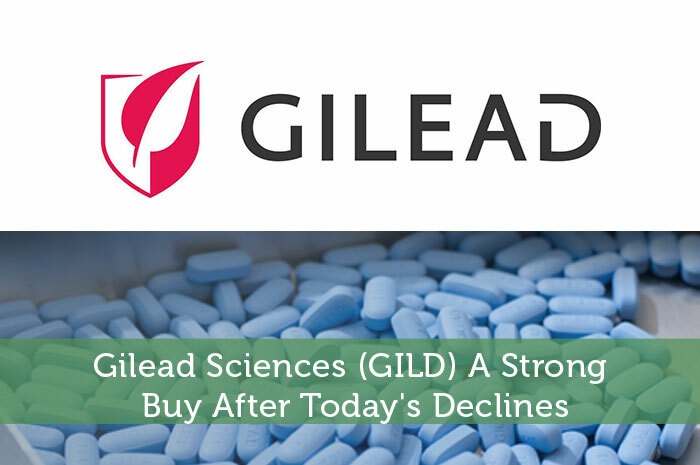 Moving forward, I have overwhelmingly positive expectations with regard to Gilead Sciences. The reality is that the company is a great company and they’ve proven that even in the face of incredible competition, they are able to keep control of a key market. Not to mention that time and time again they have blown away expectations with regard to earnings. All in all, Gilead is an incredible company with great management and one of the most compelling stories in the biotechnology space. With the exception of occasional investor fear, there’s no reason to expect that the stock would decline at any substantial rate any time soon. Where do you think GILD is headed and why? Let us know your opinion in the comments below!